We’re excited to announce the preview of Automated Machine Learning (AutoML) for Dataflows in Power BI. AutoML enables business analysts to build machine learning models with clicks, not code, using just their Power BI skills. Power BI Dataflows offer a simple and powerful ETL tool that enables analysts to prepare data for further analytics. You invest significant effort in data cleansing and preparation, creating datasets that can be used across your organization. AutoML enables you to leverage your data prep effort for building machine learning models directly in Power BI. With AutoML, the data science behind the creation of ML models is automated by Power BI, with guardrails to ensure model quality, and visibility to ensure you have full insight into the steps used to create your ML model. AutoML also emphasizes Explainability — highlighting the key features among your inputs that most influence the predictions returned by your model. The full lifecycle for creation, hosting and deployment of the ML models is managed by Power BI, without any additional dependencies. AutoML is available for dataflows in workspaces hosted on Power BI Premium and Embedded capacities. In this release, we are introducing support for ML models for Binary Predictions, Classifications and Regressions. Timeseries forecasting will also be available shortly. 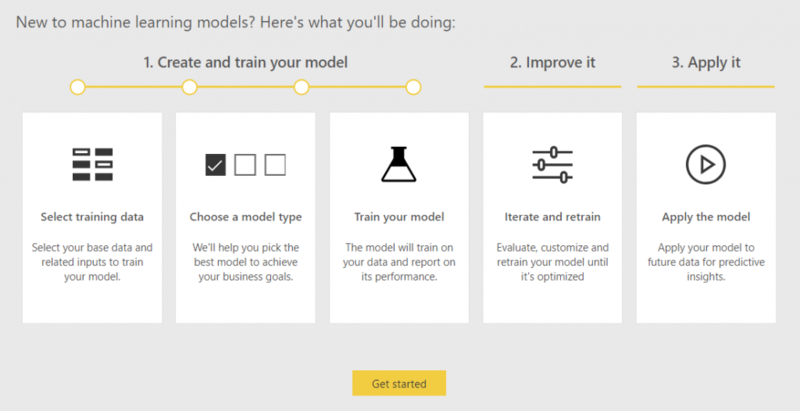 To create your AutoML model, simply select the dataflow entity with the historical data and the field with the values you want to predict, and Power BI will suggest the types of ML models that can be built using that data. Next, Power BI analyzes the other available fields in the selected entity to suggest the input fields you can use to create your model. You can change or accept these suggestions, and just save your configuration. Your machine learning model will automatically be trained upon the next refresh of your dataflow, automating the data science tasks of sampling, normalization, feature extraction, algorithm and hyperparameter selection, and validation. 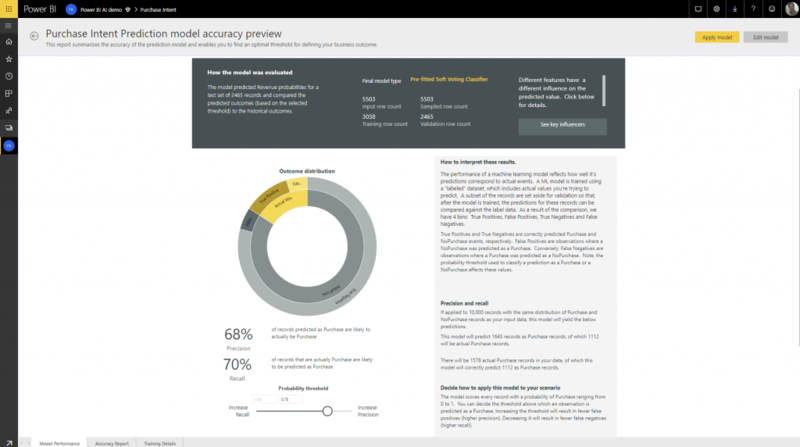 After training, an automatically generated Power BI report summarizes the performance of your ML model. It includes information about key influencers that the model uses to predict an outcome. The report is specific to each model type, explaining how the model can be applied. A statistical summary page in the report includes the standard data science measures of performance for the model. The report also includes a Training details page, that provides full visibility into the process used to create the model. It describes how each input field was transformed, as well as every iteration with the algorithm and parameter settings used to create your model. With just a couple of clicks, you can apply the model to incoming data, and Power BI keeps your predictions up-to-date whenever the dataflow is refreshed. It also includes an individualized explanation for each specific prediction score that the ML model produces. AutoML is now available for preview in all public cloud regions where Power BI Premium and Embedded is available. You can follow this step-by-step tutorial to build your first machine learning model using AutoML in minutes! You can also read about AutoML in Power BI to learn more. If you have any questions, you can reach me at @santoshc1. We’d love to hear your feedback on the experience, and ideas on how you’d like to use AutoML.